Ariella Van Luyn holds a PhD in creative writing from the Queensland University of Technology (QUT). She is the author of a novel, Treading Air (2016), and several short stories published in Overland, Southerly, Voiceworks, The Lifted Brow and elsewhere. She has co-edited a scholarly book, Sharing qualitative research: Showing lived experiences and community narratives (2016). 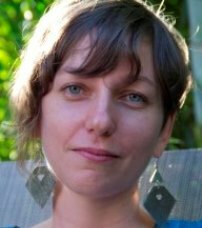 Her research interests include historical fiction, oral history, community narratives, practice-led research and regional creativity. Van Luyn, Ariella. 2016. Treading Air. Affirm Press. Van Luyn, Ariella. 2015. St Helena. Southerly. Australian Dreams 2. Gair, Susan and Van Luyn, Ariella. (Eds). (2017) Sharing qualitative research: Showing lived experiences and community narratives. Routledge. Van Luyn, Ariella, Gair, Susan, and Saunders, Vicki. ‘“Transcending the limits of logic”: Poetic Inquiry as a qualitative research method for working with vulnerable communities. In Gair, S., and Van Luyn, A (Eds.). Sharing qualitative research: Showing lived experiences and community narratives. Routledge. (Under contract, due for publication early 2017). Van Luyn, Ariella. ‘Sharing place-based stories using digital tools: locative literature and regional writing communities.’ In Gair, S., and Van Luyn, A (Eds.). Sharing qualitative research: Showing lived experiences and community narratives. Routledge. (Under contract, due for publication early 2017). Klaebe, Helen and Ariella Van Luyn. 2015. ‘In the wake of Cyclone Yasi: Facilitating community driven narrative projects.’ In Knowledge in Action : university-community engagement in Australia. Cambridge Scholars Publishing, Newcastle upon Tyne, United Kingdom, pp. 132-150. Van Luyn, Ariella and Helen Klaebe. 2014. ‘Making stories matter: Using participatory new media storytelling and evaluation to serve marginalised and regional communities.’ In Janet McDonald and Robert Mason (eds), Creative Communities: Regional Inclusion and the Arts. Bristol: Intellect Press. Barnett, Adam; Abrantes, Katya; Baker, Ronald; Diedrich, Amy; Farr, Marina; Kuilboer, Alf; Mahony, Tracey; McLeod, Ian; Moscardo, Gianna; Prideaux, Murray; Stoeckl, Natalie; van Luyn, Ariella; Sheaves, Marcus. 2016. Sportfisheries, Conservation and Sustainable Livelihoods: A Multidisciplinary Guide to Developing Best Practice. Fish and Fisheries (Accepted). Van Luyn, Ariella. 2013. Artful Life Stories: Enriching Creative Practice Through Oral History. Text. 17(1). http://www.textjournal.com.au/april13/vanluyn.htm. Van Luyn, Ariella. 2012. Jogging Alongside or Bumping Off? Oral History and Fiction in Dialogue. Oral History Association of Australia Journal. 34(1), 62-70. Van Luyn, Ariella. 2011. An Obsession with Storytelling: Conducting Oral History Interviews for Creative Writing. Ejournalist 11(1). Van Luyn, Ariella. 2010. Fictionalising Oral History: Narrative Analysis, Voice and Identity. Oral History Association of Australia Journal32(1), 68-74.